6.2.2014 On my way to looking for something else, I discovered this star. Sometimes I can just doodle, whether with ink or thread. Sometimes I have to research the meaning of the little symbols and doodads that dribble from my fingertips. It's the storyteller in me, I guess. Or better, the story lover in me -- "What are you saying to me? What's your tale?" So I picked a giant coffee-table book off one of Jim's reference shelves: The Christian Oriental Carpet A Presentation of its Development, Iconologically and Iconographically, from its Beginnings to the 18th Century by Vokmar Gantzhorn (Benedict Taschen, 1991). Maybe traditional carpet design has something to tell me. Are their designs purely decorative or full of coded meaning? Gantzhorn argues (in a nutshell) that all carpets emanating from the Armenian cultural sphere (the Middle East) start with the sign of the cross. The cross predates Christianity as a powerful amulet to ward off evil or bad luck. It was connected to divinity; to the sun; to light, life and truth. 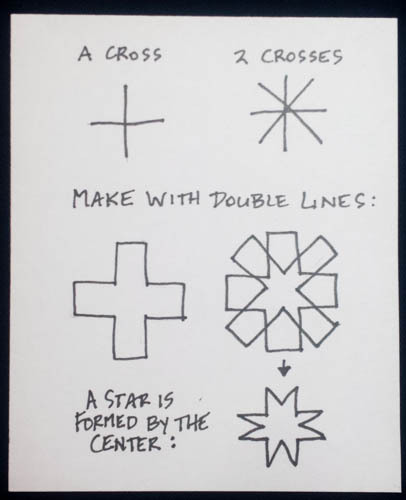 Overlap the crosses diagonally, in outline, like my sketch above, and you generate the "star cross" at its center. This eight-pointed star has become the seed for centuries of design, in carpets and in quilts. 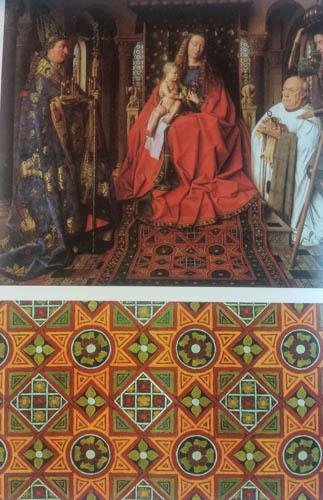 In the example here, the artist Jan van Eyck reproduced a version of this motif in his "Madonna of Kanonikus van der Paele," 1436 (Gantzhorn, Ill. 173/174, p. 125). Now I see this star everywhere, including the logo of the Missouri Star Quilt Company. I guess it strikes me because I would have never thought to draw a star this way, with its points in only 4 directions instead of 8. Elsewhere (p. 92), Gantzhorn claims this 8-pointed star-cross represents "epiphany." I'm always game for those. Yesterday I picked up another reference book from J's library: Ethiopian Magic Scrolls by Jacques Mercier. This book explains the meaning of sacred scrolls prepared by dabtaras for people who need a change of fortune. The spiritual context is an amalgam of Christianity and indigenous beliefs. I found the star again (Plate 9, see image). 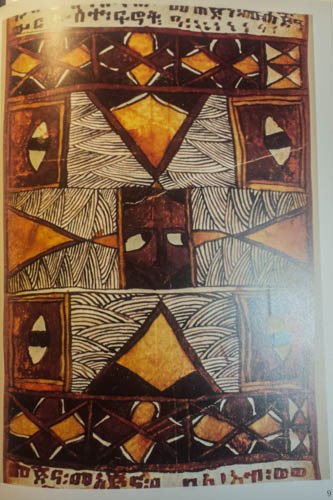 The text says that the "central design, a face within an eight-pointed star, is the most common and the most characteristic motif in Ethiopian scrolls," with many interpretations. The eight-pointed star was a universal motif in the ancient world. It is found particularly in Islamic culture, as an ornament, or as a talisman, and it is said to have been the engraving or diamond in Solomon's ring. In Ethiopia... it is sometimes called "Solomon's seal." In Islamic talismans, the central space is generally left blank or decorated with a few ringed letters. The magician sometimes writes the name of the client or of the angel in the prayer there, especially if it is a cipher-talisman. However, in Ethiopian works, a face is drawn in the center. The face might be the client, God, an angel, a demon or whatever, depending on the context of the prayer that goes along with it. The star points also have multiple meanings: the four directions of the talisman's protective power; the luminous radiance or wings belonging to the center face; or the wings of angels. The most Christian interpretation is that it represents the Cross of Christ, with the Savior's face in the center. I ask myself why this is grabbing my attention right now. I have no idea. I'm "following the disturbance." Revelations never come to me full-blown. I always have to tease out my epiphanies through study and through having a conversation with new ideas.